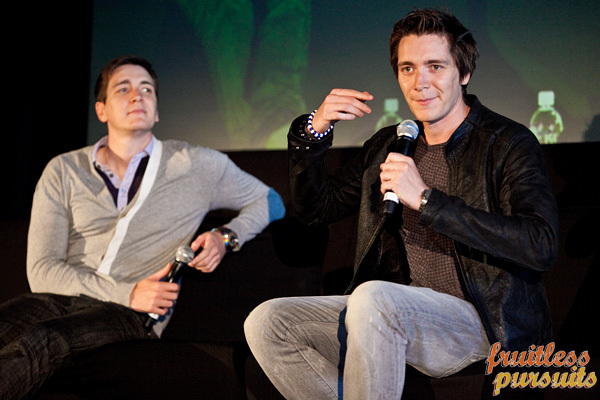 Fruitless Pursuits: The Weasley Twins at Supanova Perth 2013! 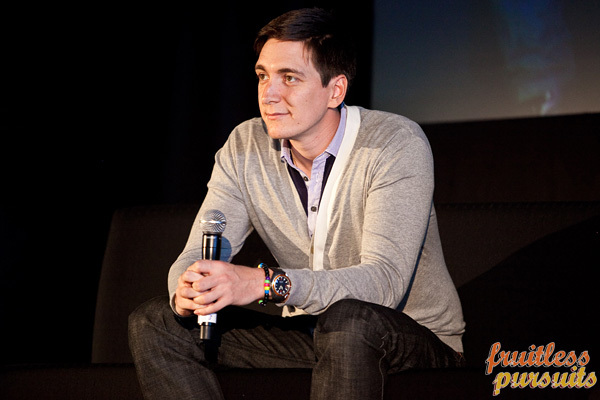 It's a privilege that Supanova have seen a market in Perth to bring out the likes of Karl Urban, Alan Tudyk, Bradley James, Carrie Fisher and in other years people like Tom Felton, Alfie Allen, Christopher Lloyd, Tricia Helfer and Natalia Tena. I am sure we all hope that this continues into the future and that the success of the convention means that we get to meet some of our favourite actors. The Phelps twins were absolutely no exception to this popularity pool as the insanely long lines on both the Saturday and Sunday surely indicated. I didn't personally brave the throng to get a picture signed or a photograph taken. I am sure you can surmise from my other convention review posts that there was a lot going on for me that meant that the Weasleys were more or less out of the question for a personalised momento. However I did attend Saturday with a friend whom I had previously gotten the Phelps twins autographs for and who was very excited to be able to take a photograph with them. She said they were proper gentlemen, introducing themselves, shaking hands and asking how her day was going. The photo turned out amazing too and I am sure many con-goers will speak of similar experiences. Quite simply put; the Phelpses seem like good dudes. They made friends with the Merlin cast, who spoke very highly of them, and were cheered wherever they went. I never saw them without a smile or laugh on their face and I think it's clear to see why they were such a favourite with the crowd. Being a crowd favourite of course comes with a unique set of responsibilities and pitfalls. After completing a round of autographs in the morning I ventured to the Weasley panel line, which was chockers an hour before they were due to appear. The line snaked back on itself about six times by the time I arrived and I asked a friendly volunteer whether she thought I would get in. Flustered, she said "I really don't know but we'll be doing our best". The volunteers mustering this crowd for the Weasley panel really need to be commended. I have never seen a group of people so well organised and able to clearly articulate information and instructions. That whole thingwould have been chaos and bedlam were it not for those volunteers. Round of applause. As I stood in line, sore and hungry with the hundreds of other people waiting, the twins were driven past on some kind of buggy and ushered into the building. The crowd cheered and punched the air, the boys smiled and waved; it was like seeing the Queen drive by, only better. As we began entering the building, following the lines snaking around each other and straightening out as the entrance appeared, I realised how many people got into the line AFTER me. There were a crazy amount of people marching in costume, carrying heavy bags with weary looks into the Film Ink room. None of the world's problems seemed to matter to them though as they entered and discovered that they had made it to the panel. It was going to happen and they were going to witness whatever it was that was going to happen! All the seats were well and truly filled by the time I was allowed inside and as people filed down the sides for standing room and just kept coming it became clear that this was the biggest panel of the event. Once every inch of space was taken up (allowing for the fire and safety procedures of course) and the room was brimming with excitement, the Phelps twins took the stage. Oliver introduced himself and his brother to raucous applause saying "I'm Oliver and this is my brother James... today". The cheeky implication set the scene for a very fun panel full of quips and banter that was going to entertain for the full hour. Sitting on separate sides of the long black couch on stage, the boys delved into answering questions from old and young alike; many about what it was like for them as twins. When asked if they preferred being a twin they both answered that they have never known any different. For them it was like being asked what it was like to have a sister or a brother; it is normal for them. There were some perks of course; they could borrow each other's ID or as Oliver joked, they perhaps only needed one gym membership. This came in handy when James was sick on a day of filming. Oliver said he wouldn't say what scene it was because he thought it would ruin the scene forever, but he stood in for James and next to him was his stunt double who looked nothing like him and was wearing a ridiculous wig! When asked if being a twin or being referred to as twins ever bothered them, Oliver explained that it was important that they had their own friends and that as people got to know them they realised that they were two different people. Of course being a twin wasn't all bad; that's how they got the role of the Weasley twins and certainly coming out to conventions was something they had to do together and were very happy to do as well. When asked if the Weasley twins were modelled on the relationship that the Phelps' themselves had with one another, James told a very funny story about twins that they went to school with. One was good at cricket and the other good at science and so when exam time came they sat each others’ exams, hoping to get great grades in both for one another. The science twin was called to the Principal’s office after the exam because his brother, posing as him, had argued so much with the umpire that he'd gotten suspended. James said those were the twins that they modelled the Weasleys on. Moving further into their relationship as brothers they were asked how they reacted to filming Fred’s (James') death scene in the final Harry Potter movie. Both boys agreed that it was totally fine and they didn't really have any emotional stories about it. James even said that he fell asleep during rehearsals one time and it really wasn't hard for him other than pretending not to breathe. Seems Oliver didn't find it much more difficult though he of course had to play the emotion in the scene. Once it was done though there wasn't any emotional embrace as was reported in the media with a long conversation about how much they meant to each other... Oliver kicked James to wake him up so they could get going. Oliver insisted that nothing like the embrace that the articles featured was ever EVER likely to happen between them. James commented that when he discovered what would happen to Fred after reading JK Rowling's final instalment he was on a train being asked for his ticket. He was shocked and comically couldn't quite get past that he had died in fiction. He kept gesturing to the book saying “Dead” to the ticket collector. Although he was shocked he thought that it was very good for the story and liked that it showed that the twins were individuals and that one’s path did not necessarily reflect the other’s. Oliver told a great story about loving his own character's maiming in the previous book, saying that with all the blood and gore affixed to his ear he had gone out to watch sport and looked like he was in the Green Street Hooligans. He then fell asleep with it on back in his hotel room and woke with it all plastered to the pillow. The maid was NOT happy! Someone asked what had happened when they dyed their hair red for the films and they answered with their trademark laid back approach; it really didn't matter. They told their friends that it was for a movie and they seemed to accept that. What was interesting was that they elaborated that in fact, a lot of their friends didn't like Harry Potter or think it was cool so they weren't very interested in what the twins were filming. James did say when they got older it got a little more fraught with being asked back to visit girls and then seeing posters on walls and putting two and two together. That garnered many laughs. They commented that they didn't mind watching themselves in the movies when they had gotten older, but that watching the earlier films was akin to watching child home videos that the whole world could see and were a little creepy and disconcerting. And do they still hang out with their cast mates you ask? Yes they do; especially Rupert and Tom. They commented that these were the people that they spent a lot of time growing up with and that naturally many close bonds had formed that they continued with after the end of the films. Someone asked whether they referred to each other by their character names when catching up as Tom Felton allegedly always called Daniel up and greeted him with "Potter". Both Phelps brothers confirmed that this was a Tom thing and that generally speaking no one else did that. The Weasley twins are pranksters to the core; are the Phelps twins? Yes. Though perhaps not to the same extent. Oliver told a story about getting someone's car repossessed and spelling out the email address to pick her car up over the phone as oliverphelpsgotyouback. They conceded that they had never blown up a toilet though, mainly because they didn't know how to. When an attendee said that her brother had once done it by constantly pressing the flush James bolted up as if he was about to go try it out! They explained how the way they filmed Quidditch scenes changed over time and with new technology; first starting out static with a camera moving around you and then progressing to vastly better technologies. Favourite scenes? Well, they loved growing beards in the Goblet of Fire when they put their names in the goblet and they enjoyed learning to ballroom dance for the ball, which they never thought they would do. It sounded like that film was a good time for the lads as they sported long hair and said that they were big into metal at the time. What house would they be in in real life? The twins said they were sorted at Universal and while Oliver came out a Gryffindor as his character in the book, James came out a Hufflepuff. Towards the end of the panel someone asked if they got sick of being around each other all the time and they of course said yes. Oliver joked that this was why they were sitting so far away on the couch from one another! But he added that this was true of all siblings, especially those in close quarters with one another for so long and for the most part they got along really well. If they had a falling out they would sort it out and they were incredibly genuine about their relationship in front of so many complete strangers. To close out James thanked the people of Australia and Perth for being so warm and friendly and both he and Oliver expressed their thanks at being received with some much enthusiasm by so many lovely people. 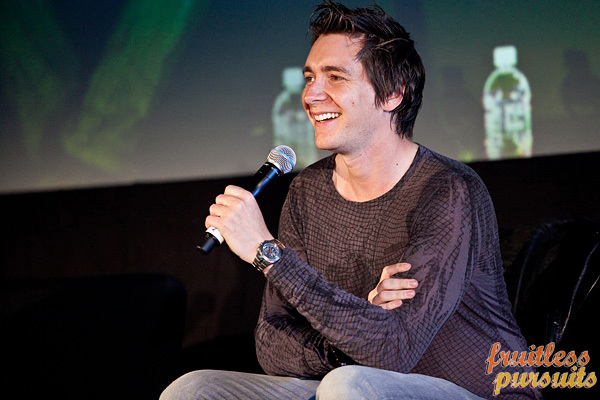 They said that they really enjoyed the convention circuit, meeting fans and meeting the other actors on the convention tour like the Merlin cast and Kai Owen from Torchwood. I hope all of you got the keepsake you wanted from them and can share your own stories of Phelps encounters here at Fruitless Pursuits!